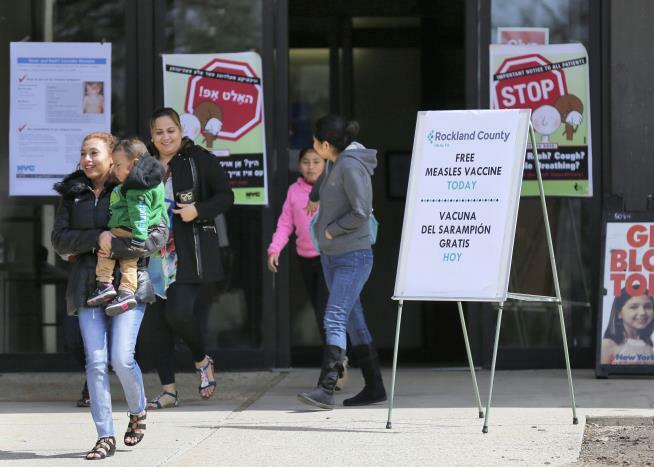 (Newser) – A group of Brooklyn parents has sued the city's health department to block its its order making vaccinations mandatory, even as federal health officials reported the biggest increase this year in measles cases across the country. The parents say the emergency order last week violates their religious beliefs, the New York Post reports. Their suit filed Monday says the outbreak isn't serious enough to warrant the order, which gave residents 48 hours to get vaccinated, because no deaths have been reported. The vaccine also covers mumps and rubella, "which are unnecessary and carry the risk of harm," the suit says, especially for children younger than 1 and women who might become pregnant. The order requires everyone 6 months and older living, working, or attending school in certain zip codes of Williamsburg, Brooklyn, be vaccinated, per ABC. As long as the unvaccinated children stay home and have no contact with the outside, it's no big deal. It is ignorant, but the parents should have that right. If these parents want to send their unvaccinated children into a school system, day care or other public venue then it's not okay. Exposing other adults and children to their diseased offspring is socially unethical and selfish behavior. Hey Newser, I can't even browse your webpage without having to see 2-3 disgusting ads for toe fungus or some other extremely visceral body horror crap. Get better sponsors.